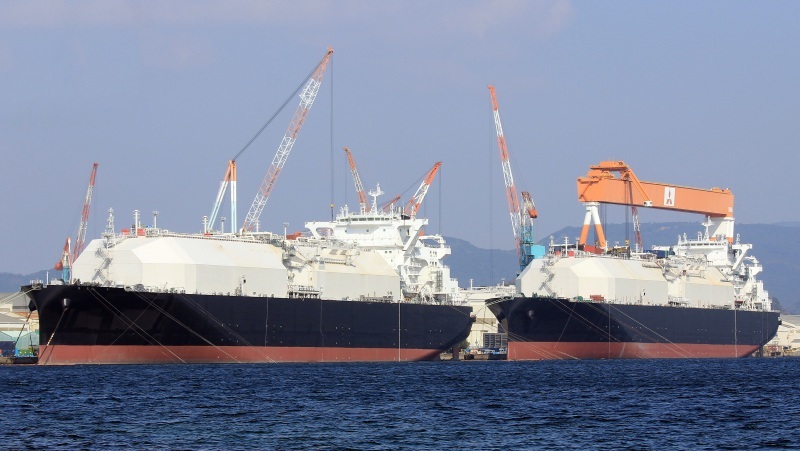 What looks like two SAYARINGO STaGE CLASS LNG CARRIERS new generation LNG carriers fitting out at Mitsubishi shipyard in Koyagi, Nagasaki. The one on the left is to be chartered by "Diamond Gas International", as marked on her funnel (not really visible on this shot). The name is to begin with "Diamond" - there's her sister in the dry dock nearby. The one on the right is for NYK, with her striped funnel. I have no other info, so it's welcome. Suppose that the "Das" is a typo in IHS/SeaWeb which would be the Equasis source. The third Diamond Gas sister (Yd 2332) is IMO 9810020, not due for delivery 5/2009. 2331 - IMO 9795672 - due 12/2018 - ?? 2332 - IMO 9810020 - due 5/2019 - ?? Could be this one for Diamond Gas Vlad, Mitsubishi Nagasaki 2325 - DIAMOND DAS ROSE - IMO 9779238 for Diamond Gas Int., the name is spelt as DAS not GAS on Equasis.